I don’t want to make a political speech tonight. I want to tell you a story. Because, you know, my people tell me that telling stories makes me seem ‘real’ and sincere. So tonight, I want to tell you about somebody that I met once. Let’s call him Bill. I used to meet Bill at the petrol station, where we would chat happily while we were filling up our cars. Bill used to be a staunch supporter of the Labour Party. He joined the Labour Party as a young man, full of hopes about changing society, eradicating poverty and instituting equality. Long ago, in times gone by when people did this sort of thing, Bill would go along to his local party meeting and discuss ideas with other socialists. They would argue together, campaign together and socialise together. Sometimes it would get quite raucous, but at least it was interesting. Gradually, however, strangers in suits appeared in Bill’s party – odd people who didn’t seem to speak Bill’s language and didn’t share the same values. He couldn’t help but feeling resentful and wish they’d go back to where they’d come from. But they stuck around, replacing the debates with “business” and the campaigning with something they called #labourdoorstep. Bit by bit, they took over the party, bringing their friends from far away (London). One of them became the constituency MP and the rest her acolytes. Bill’s friends disappeared. He felt like a stranger in his own party. Then one day he opened his laptop that he’d been bought by his daughter last Christmas, and clicked on the link to the GMB website on his favourites. By coincidence, his union was live streaming the Labour leadership hustings, where the leading candidate of the centre left was telling a story about a UKIP voter who sat on his own at work, because no one spoke his language. 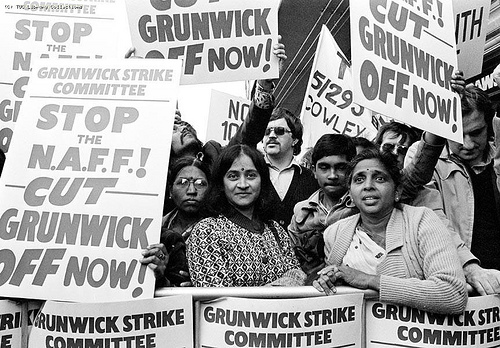 Bill cast his mind back to his youth, and how he stood on picket lines in #solidarity with Gujerati women at Grunwick. He sighed heavily and wondered whether we couldn’t do better than this? There is only one anti-austerity candidate. There is only one candidate who is proud to back trade unionists whenever they take industrial action. There is only one candidate who will argue the case for public ownership of our railway network and utilities. There is only one candidate who will state that we must tackle the housing crisis by bringing in rent controls and commit our party to to a proper programme of building social housing. There is only one candidate who believes that the minimum wage must be a living wage. There is only one candidate who will say that education must be a universal right. There is only one candidate who stands for peace, opposes Trident and stands in solidarity with people struggling against injustice throughout the world. And I know that in your heart of hearts, you believe in all of these things too, because these are the values which define our movement. That candidate is Jeremy Corbyn MP and he deserves your support to get him on the ballot paper. Having such a voice in the Labour leadership debates can only be of benefit to our movement and you have a responsibility to ensure that it happens. Open Letter to three good comrades: please nominate Jeremy Corbyn and give us the debate we need. Yesterday, I spent a couple of precious hours writing a politely worded, standard letter requesting that Labour MPs open up the Labour leadership race for the debate we really need by nominating Jeremy Corbyn and allowing him onto the ballot. Waking up this morning, however, and mulling over where we stand, I thought a more personal appeal was in order. When Ian L was considering standing, I messaged him to say that I would give him my full backing. I believe Jeremy, John McDonnell and the rest of the left of the party would have done the same. Solidarity is something which is alien to those on the right of the party, but it is our lifeblood. Throughout my membership of the party, I, like many of the others in the North East have supported, defended and felt proud of the contribution that you three have made, both inside and outside Parliament. So I’m asking for a small bit of that solidarity now. I understand that you have all given your backing to Andy Burnham. I don’t want to get into a big debate about Andy’s politics, or his political “journey”. That isn’t really what this is about. As it happens, I quite like Andy – and if Jeremy Corbyn was to get on the ballot, he would probably have my second preference, just like Ed Miliband did in 2010. However, as has been shown in the ‘debate’ so far, he doesn’t cut a distinctive enough figure politically to move the discussion in our direction. Already, he has tacked rightwards on the Mansion Tax, immigration and the deficit. I can’t see how that drift will be corrected without a left voice in the debate. You all three committed yourself to Andy’s campaign early on, well before the nomination period begins on Tuesday, so I must assume that you are seeing something that I don’t at present – and I accept that in good faith. However, in committing yourself like that, I wonder whether you have fully considered the repercussions for us as a party and a movement. I’m now asking you to reconsider for the sake of us all. Granted, maybe that conversation where you say, ‘Look, Andy – I wasn’t quite aware of the situation at the time’ might be a little bit awkward, but let’s not kid ourselves or anyone else. This isn’t about ‘principle’ or ‘going back on your word’. Principle is defending your communities, fighting for our collective rights and being true to our history – all things that all three of you do, day in, day out. Nobody in Blaydon, Gateshead or Ashington is going to give a damn whether Dave Anderson, Ian Mearns or Ian Lavery changed their minds about their nomination for the Labour leadership, just as no one will have criticised Grahame Morris in Easington for switching his nomination to Jeremy just two days ago. Those things are understood as part and parcel of politics: people overcoming a bit of pride to do what is in the common interest. As far as I can fathom, there can only be two reasons for continuing to stick with Andy Burnham in a situation where he has more than enough nominations. The first is political: to strike the first blow against the candidates to Andy’s right. The more nominations, the more credibility, right? There is a superficial logic to that, but I think it betrays a lack of confidence of Andy as a candidate. Allowing some of his supporters to switch in order for the whole party to be represented will not only be appreciated by the left of the party, but will be seen as a sign of strength. I also think that, probably due to the Westminster bubble, the merits of Liz Kendall, as the Blairite candidate of choice, have been vastly overblown. If the AB camp can’t beat a candidate who advocates more Free Schools and privatisation of the NHS during a four month leadership contest, then we really are in trouble. The second possible reason must be down to positioning. Presumably, putting your weight behind Andy at that early stage was seen as a way of gaining some influence and cementing a relationship that would benefit the left in the future. Again, I’m not against positioning. I’m not a purist – there are times when it is important to make alliances for the greater good. Now is not one of those times. Why? One reason in particular: because we have just suffered the most catastrophic defeat just over that border there – and if we’re not very careful indeed, we are in for more of the same in places like the North East, North West and Wales – our heartlands. I know you are all close to things on the ground, so you understand that the sands are shifting. There is a dangerous anti-Labour feeling which has been rumbling away for more than a decade, but has erupted recently in Scotland. At root, it is about how New Labour distanced itself from those heartlands and how removed the party has become from its own constituencies – the working class, the unions and their communities – as a consequence. We have to get a grip of this, by building once again from the grassroots upwards. I know you all understand this, but here’s the point. I can think of no greater gift to those who say “they’re all the same” than a lengthy and anodyne leadership election which splits hairs about aspiration, immigration, the deficit and welfare, without ever offering a real alternative. Jeremy will do this, purely by his presence. Instead of the vicious cycle of more and more of the political agenda being set by the right-wing press, Jeremy Corbyn’s presence in the leadership race will have the effect of dragging the debate on to our terrain. The importance of this can’t be overestimated. Without that honest and frank debate, it might not matter who wins the leadership election, because of the damage done. So here’s the score. It’s quite simply in your hands to give the party membership what the discussion they want, but even more importantly, to safeguard the party against further damage amongst our traditional support, many of whom have deserted the party since 1997. We didn’t ask for this electoral system, which gives so much power to MPs to decide on behalf of the party who are the ‘acceptable’ leadership candidates. It’s not right, it’s not democratic and it’s not fair to the thousands of activists who keep this party going. The Parliamentary Labour Party has been cultivated by Blairite pressure groups such as Progress for two decades. No wonder the vast majority don’t want a real debate. What we expect from “our side” is simply to be represented – and to have some of our solidarity reciprocated. Please help give us the debate we need by nominating Jeremy Corbyn. It is fantastic that Jeremy Corbyn has declared his intention to stand for leader of the Labour Party. Put simply, Corbyn’s record speaks for itself. During the Blair years, he opposed the New Labour project at every turn – voting against the privatisation of public services, PFIs, academies, tuition fees, Trident and was a tireless campaigner against Blair’s disastrous and criminal wars. Corbyn also opposed every capitulation of the previous Labour leadership – voting against the welfare cap and refusing the instruction to abstain over the government’s illegal use of workfare. As well as being active in the peace movement, Corbyn is a committed supporter of the trade union movement, who has stood on countless picket lines and has proudly addressed Britain’s biggest trade union celebration – the Durham Miners’ Gala. 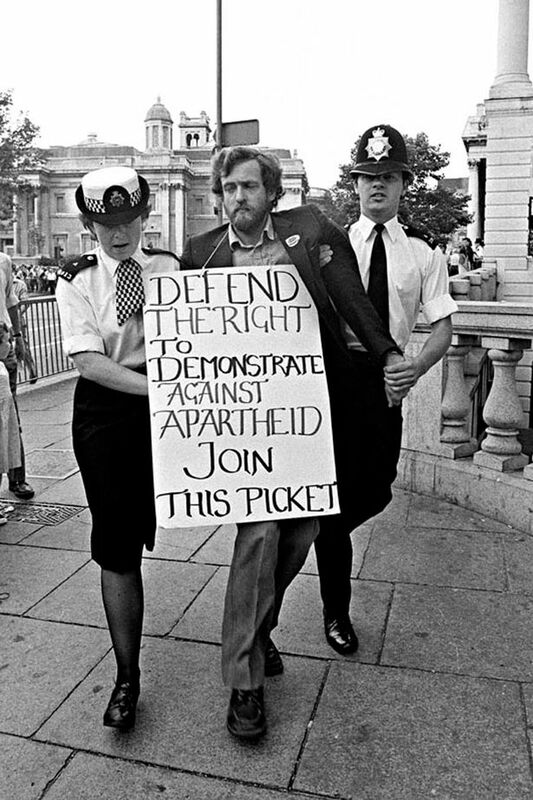 In short, he is a lifelong campaigner for socialism and peace. There are still plenty of people in the Labour party who believe in a society built upon those values and their voice deserves to be heard. So urge your Labour MP to nominate Jeremy Corbyn for leader of the Labour Party and let’s a have a proper debate.